Our next meeting will be held on Wednesday 12 February 2014 at 7.45 am for 8.00 am in Alexander’s Restaurant, Best Western Scores Hotel, St Andrews. The cost of the meeting will be £10.50 per person. As usual any guest who may be thinking of joining the Club will be welcome free of charge. Our guest speaker will be Donald Ford of Donald Ford Images. Donald Ford was born into a sporting family. His father won three Scottish caps at cricket, his elder brother Malcolm won nineteen (both were also talented football players) while his mother boasted a Ladies’ Championship victory at Linlithgow Golf Club. Football took priority for Donald and in 1964, while halfway through a five year indenture to a firm of Edinburgh Chartered Accountants, he signed for Hearts and then, having passed his CA finals, he signed professional forms with the club. He subsequently enjoyed a further seven seasons at Tynecastle, winning three League caps and three full Scottish caps to add to nine amateur caps and was a member of the Scotland World Cup squad at the finals in 1974. A knee injury brought his football career to an end. His cricketing career with West Lothian County blossomed however, and during his third year as captain of the club, he was included in Scotland’s first ever Benson & Hedges squad. Professionally he continued to practice as an accountant. Increasing legislation from government and accounting bodies added to the considerable pressures on a sole practitioner and he sold his practice in 1991. He then embarked on a new career in Scottish landscape photography. In 1994 he bought an old property in South Queensferry and opened the Donald Ford Gallery. He began publishing his work and his first Scottish calendar for 1996 went on sale with all 4,500 copies selling out. Since then, several large books of both his landscape and golf photography have been published, together with diaries, address books and calendars, many of which have gone all over the world. 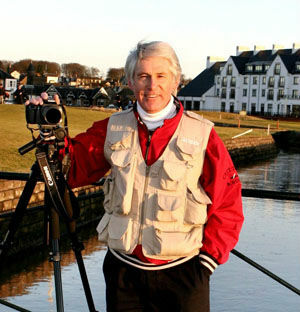 His work is widely distributed to both private and corporate sources and the annual publications of his Scottish golf course photography, in particular, are now acknowledged as the finest available. He has gained recognition as one of Scotland’s outstanding photographers of golf courses.